Just like not every boy meets girl story ends with the two falling in love and living happily ever after. Not every musical is full of splashy production numbers, moving sets and dance breaks. These are both prime examples of what makes Once a stunning and non-traditional musical. Set in a Dublin pub, Once tells the story of a heartbroken Irish guy who writes songs about his ex-girlfriend while repairing Hoovers to pay the bills and a young Czech woman who befriends him and pushes him to chase his dreams. Known simply as “Guy” and “Girl”, Stuart Ward and Dani de Waal, are perfectly cast for these roles. Their voices blend beautifully on “Falling Slowly”. The rest of the cast play various supporting roles throughout the show. And when they aren’t part of the current scene they sit in chairs lining the stage ready for their cue to begin playing. The unique aspect of Once is the entire cast pulls double duty as the orchestra as well. The set is an unassuming Irish pub in Dublin. No moving sets or scenery flown in from the rafters. Just simple tables and chairs are used with a few other props to transition us from scene to scene. Speaking of the set, another unique aspect of Once is the pre-show and intermission bar on stage. Prior to the show and during intermission the set is a functioning pub offering a small selection of beer and wine. Audience members are invited onstage to watch the cast hold a jam session. Slowly the audience moves to their seats and the show begins without a huge opening number. I feel this approach allows the audience to have a more intimate connection to what is transpiring on stage and feel as those you are peering through the window of the pub. Once is a stunning love story. But not in the sense we are accustomed to. A love story in the sense that every person and situation we cross in life brings us closer to finding what truly makes us happy. Our purpose in life and finding our way to the person we are meant to be with. 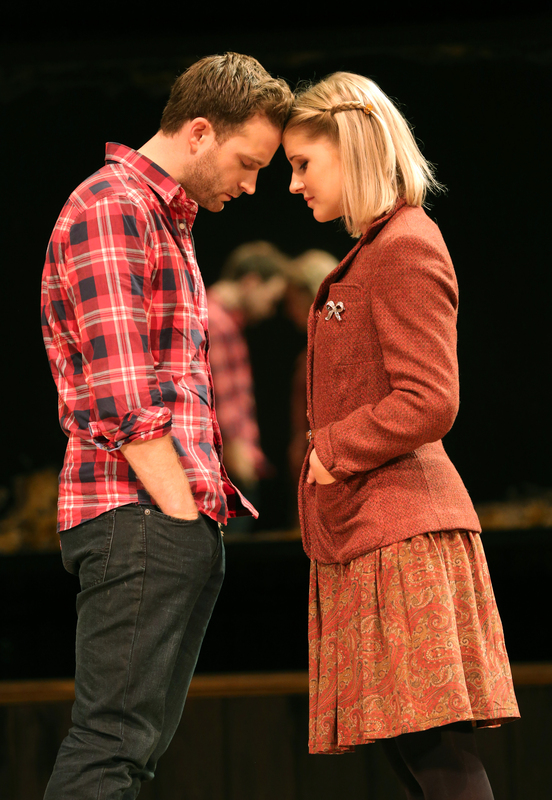 Once is playing at the State Theatre in downtown Minneapolis through June 28. For more information on the show visit Hennepin Theatre Trust’s website.